surrealist wash-"booth". i like how the paint application flatens out the dimensions of the niche. maybe even a little less vertical paint marks at the corners for even greater effect? love the mirror & lamps. the faucets seem not as well though out as the other things. they should be silver in color, but something different than "basic". but not too different. let the mirror & lamps steal the show. Well, you're never gonna beat that, are you? Not sure if I love or dislike. Sure the color is beautiful but not sure if I would want this in my house. 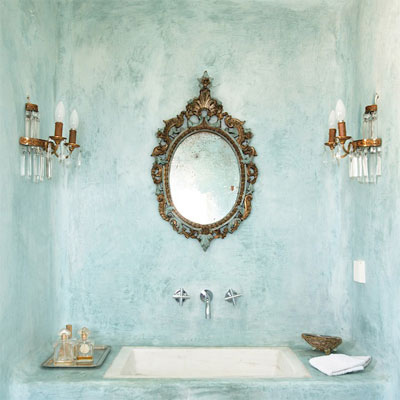 quite simply; the most beautiful sink and surround I have ever seen anywhere in my entire life! Thank you! And,as you know, I mean it! Looks like lime wash; exquisite in every way. Hi! I left a comment on this very pretty space. I won't be leaving any more. Your false "comments" quoting "Mario" and ""Bunny" are just too stinging. Not funny. I always thought the other ones were some "anonymous"...no.......I think they have always been you. so......as you said so well : "that's all ,folks!" It makes me sad; however......there it is! Kinda soothing in a picture; incredibly tacky in person. Is that venetian plaster? God, I love that color! This is stucco--the same stuff on the exterior as California Spanish homes. Rough finishes used to be popular and now the modern homes do a smooth finish. We did this in our shower and it's pretty low maintenance.